In Northeast Florida too many babies die from preventable causes and lack of health services. 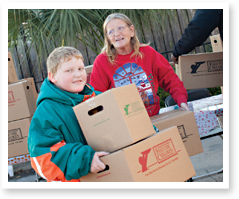 The Healthy Start Coalition leads a cooperative community effort to reduce infant mortality and improve the health of children, childbearing women and their families in Northeast Florida. 2018 was a year of growth and success for the Coalition. 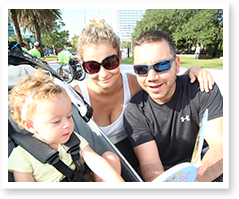 Our Annual Report features highlights from all of our initiatives and events across Northeast Florida that furthered our mission of every baby having a healthy start in life. Baptist Health/Wolfson Children’s Hospital, UF Health Jacksonville and Florida Blue announced at the annual FIMR Community Meeting that they are combining to contribute $50,000 to fund the review of every 2017 infant death. 2017-18 Fetal & Infant Mortality Review results were released along with the status of maternal and child health in the region at the annual FIMR community meeting. Chloe Cooper accomplished many things while enrolled in the Nassau County Healthy Start program. We are super proud of Chloe - a happy, healthy mom helps her kids have a healthy start! Healthy Start participant Asrael Warren considers Belinda Jones to be more like a sister to her than her Healthy Start care coordinator – but is grateful to have Ms. Jones in her life in any capacity. Healthy Families Jacksonville participant Sherrie McCullough shares a mother-daughter bond with Annie Thomas. She credits Annie’s love and encouragement with helping her exceed her own expectations of being a great mother. The Coalition completed a new five-year Service Delivery Plan that aligns with our three main areas of focus and integrates a life course framework, with a heavy focus on health equity and the social determinants of health. The Coalition's newest initiative was created to certify organizations who provide parenting resources to their staff. I am a Healthy Start Employer aligns with your values as an employer to invest in the health of your workplace and community. The Northeast Florida Healthy Start Coalition's purpose is to provide every baby with a healthy start in life and we cannot do this without help from the community. "Nurse-Family Partnership has given me the confidence to believe in myself as a first-time mom. The visits to my home where my nurse and I talk about my child’s development as she grows allows me to understand my baby more. The questions I have never go unanswered." "The Coalition brings together key partners to support investment in services that support the healthy development of babies, our community's most valuable citizens."